This CD reissue is like the third ever disc I've heard by these long running British progressive rockers. I have friends here in the states that remember over thirty years ago when Man was the support band for Hawkwind. Not sure if this self-titled lp, that was originally released in 1970 was their first or third actual album. Two different sources I checked out on line said different. 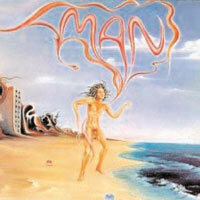 Either way, ' Man' is much welcomed in the department of classic album reissues. Man does a great job of combining the elements of blues guitar, psychedelic vibe & attitude with a West Coast feel to their music. This pressing adds two bonus tracks onto the initial platter. "Romain" has a nice forward blues rock tone to it, as "Country Girl" is a country laced pop oriented number that will likely remind fans of the New Riders Of The Purple Sage and "Would The Christians Wait Five Minutes" is a thirteen-minute breath taking psychedelic jamming instrumental. Also dug "Daughter Of The Fireplace", a straight ahead heavy rocker that makes one of this CD's bonus cuts, the single edit of the same song even more desirable. "Alchemist" is a superb twenty-one minute epic, of almost psychedelic experimental (if you wish to call it that - maybe the disc's best track altogether). An extremely well laid out composition. Nearly forget this CD closes with the original version of "Alchemist" but I think I may like the album version better. Line-up: Deke Leonard-guitar & vocals, Roger Leonard-steel guitar & piano, Martin Ace-acoustic guitar & vocals, Mickey Jones-electric guitar & vocals and Terry Williams-percussion. Should appeal to fans of Savoy Brown, Uriah Heep, Camel, Caravan and Wishbone Ash. Recommended.